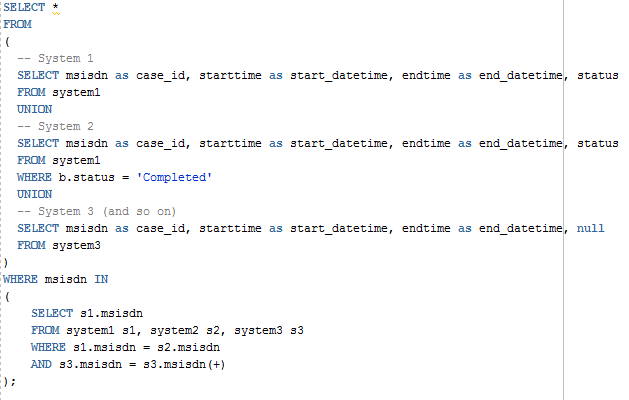 I am using the following SQL query to join eventlogs from multiple applications into one log. According to the literature this is called a ‘raw data merge’. I like this kind of join since it is adaptable and quicker when merging logs from more than two applications. The results of this query can be further processed by exporting them as a CSV and loading them into a conversion tool for eventlogs (XESame, Disco/Nitro, ProM Import). To merge cleaned logging data and output in a suitable format for conversion to .xes or .mxml. 1. Export logfiles from an application that fulfill the requirements for process mining (see image). 2. Import some logfiles into a database, one table per file (for example CSV file import using SQL developer and Oracle XE db). 3. 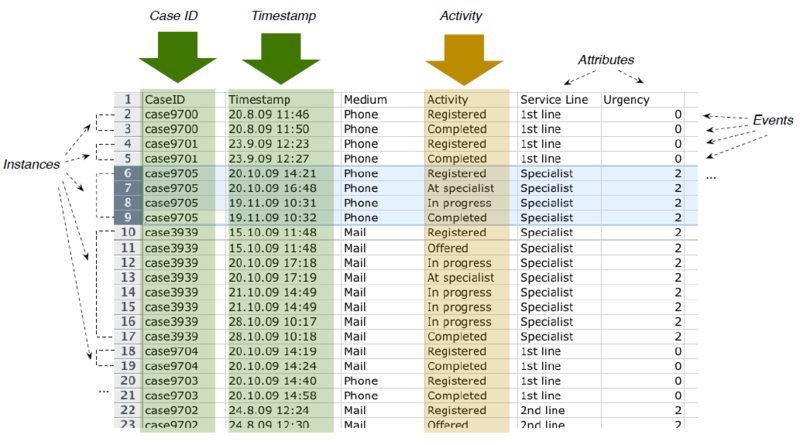 Clean the data by making case id and timestamp format match. Also make sure the appropriate datatypes are used. 4. Adapt the following query to suit your situation and execute. 5. Export the results to a CSV file (SQL developer: right click, export, CSV file). 6. Convert the CSV file with the merged logs using a conversion tool.